A hippie-minded vegetarian goes to the local gun-club. 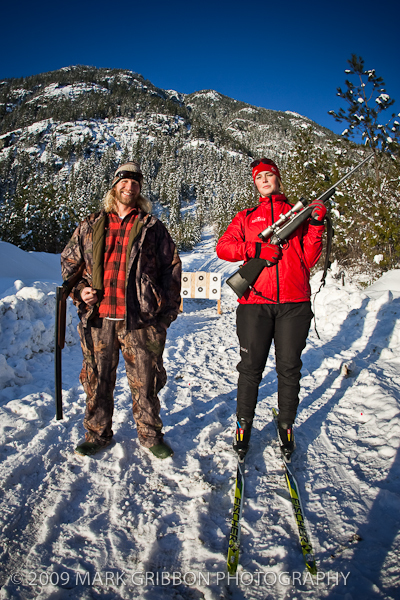 Sounds like the opening line to a bad joke… or fodder for a limerick… but it was a Boxing Day deadline to write about the Pemberton Wildlife Association‘s shooting range. PWA members Clarke Gatehouse and Al McEwan were a little nervous when a city-bred vegetarian female journalist called up and asked to arrange a photo shoot, tour and interview during their annual Boxing Day Turkey Shoot. I assume, as shooters, they’ve been burned before by mainstream prejudices… But they were gracious gentlemanly hosts. Imagine my pride to be the talk of the HuntingBC.ca chatroom. Oh dear. Some carnivorous vibe seems to be rubbing off. Canada Day in Pemberton saw the self-proclaimed vegetarian chow down on a sausage in a bun. Granted, the sausage was handmade by Chef Maxim Ridorossi of the FoodLovers in his new snag-maker, just 2 km from my house, from Pemberton Meadows Natural Beef, grown a further 20km from my house. And granted, I had run-shuffled the 7km Spud Run that morning, so may have been responding to a visceral appetite for protein. But there it is. Sausage-eating Vegetarian? Perhaps I should change that to Proud Locavore.